Bashan restaurant is the brainchild of chef/owner Nadav Bashan, an Israeli native who, while in college, decided to act on his longstanding interest in cooking and pursue a culinary career. After graduating from Pasadena's California School of Culinary Arts, Bashan worked under Allyson Thurber (opening chef at The Water Grill) at The Lobster, her new restaurant situated on the Santa Monica waterfront. 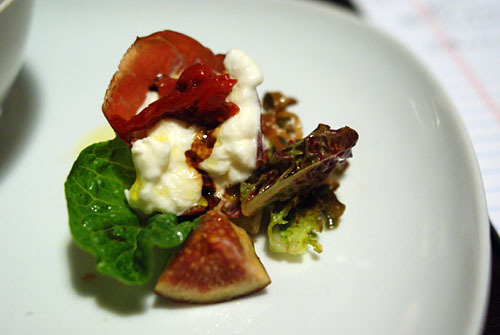 Bashan spent just under two years with Thurber before taking a Sous Chef position at Michael McCarty's eponymous Michael's, also in Santa Monica. He spent three years there, and was promoted to Executive Chef by the end of his tenure. Later, Bashan moved to Providence, where he sous'd for none other than Michael Cimarusti (who, like Thurber, also headed the kitchens at Water Grill previously). After his experience at Providence, Bashan felt ready to open his own restaurant, and did exactly that in September of 2007, partnering with his father Ram, brother Yaniv (who designed the interior), and wife Romy (who also runs the front of the house). 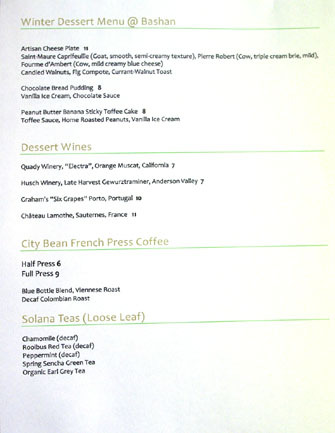 They purchased the space that used to house Michael Ruiz's Bistro Verdu, which shuttered at the end of June that year (Ruiz, meanwhile, recently opened and closed--after two weeks--Fork). As Bashan is situated in a locale where higher-end eateries are somewhat rare, the restaurant brings a welcomed addition to the dining scene--a casual neighborhood eatery that just happens to be fine dining. 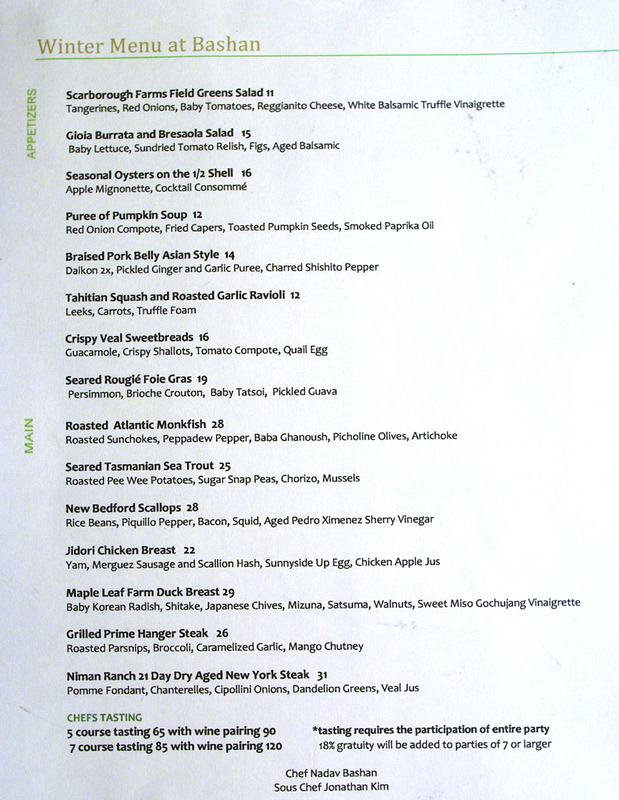 The food is market driven and seasonal, based in classic French technique with healthy doses of Californian, Mediterranean, and Asian influences. 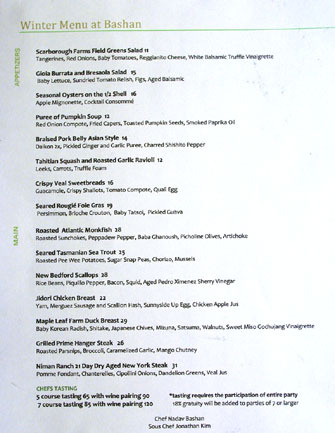 The "Asian," by the way, is largely due to the handiwork of Bashan's Sous Chef Jonathan Kim, who started in August 2008. A graduate of CSCA's Le Cordon Bleu program, Kim previously worked at Providence, Taste on Melrose, and Water Grill (where he met his future employer). This dinner was organized by Jane and Selina, both readers of kevinEats. Jane, it turns out, staged at Bashan at one point, and still kept in touch with Chef Kim, who served as our point of contact at the restaurant. Inside the smallish (less than 1000sqft) 40-seat dining room, designed by co-owner Yaniv Bashan, things are awash in tones of beige and brown. Meandering staves of driftwood adorn one wall, while the other is enrobed in a sort of grassy cloth, and boasts a large mirror. A custom walnut wood wine rack shields the dining room from the kitchen. Meanwhile, up above, starbursts double as chandeliers. The whole mélange is a bit stark, minimalist, bare even, but the overall effect is comfortable enough, and focuses your attention on what's on the plate. 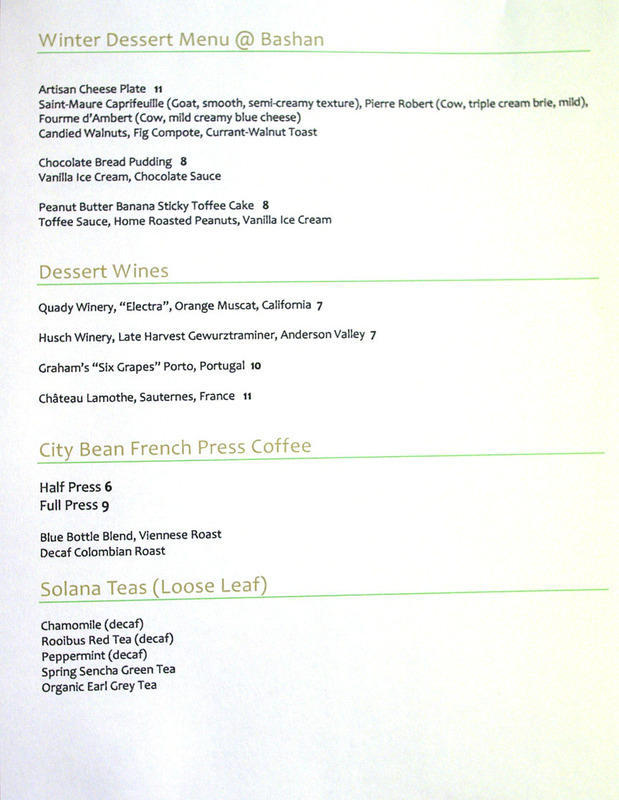 Above, we have Bashan's dinner and dessert menus; click for larger versions. Due to the limited space in the Lilliputian kitchen, Bashan's carte is tight, focused, comprised of about a dozen savory courses and a smattering of desserts (there's no pastry chef, so Bashan himself must handle the sweets as well). 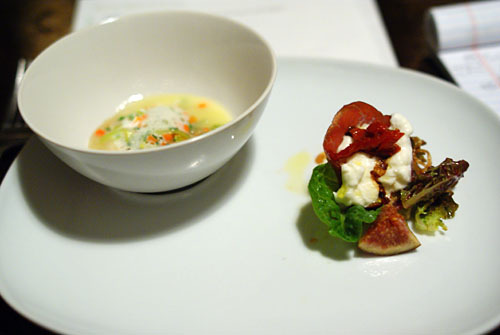 Going à la carte is of course a possibility, but you might want to step up to a tasting menu. We did the seven-course at $85, augmented by two extra courses for $10 each. 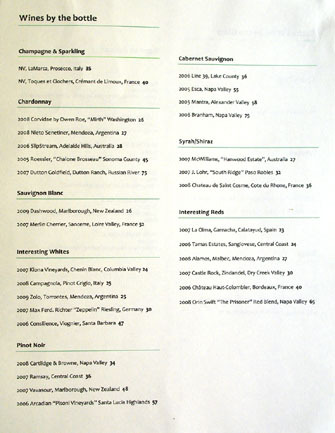 Wine pairings were an additional $40. 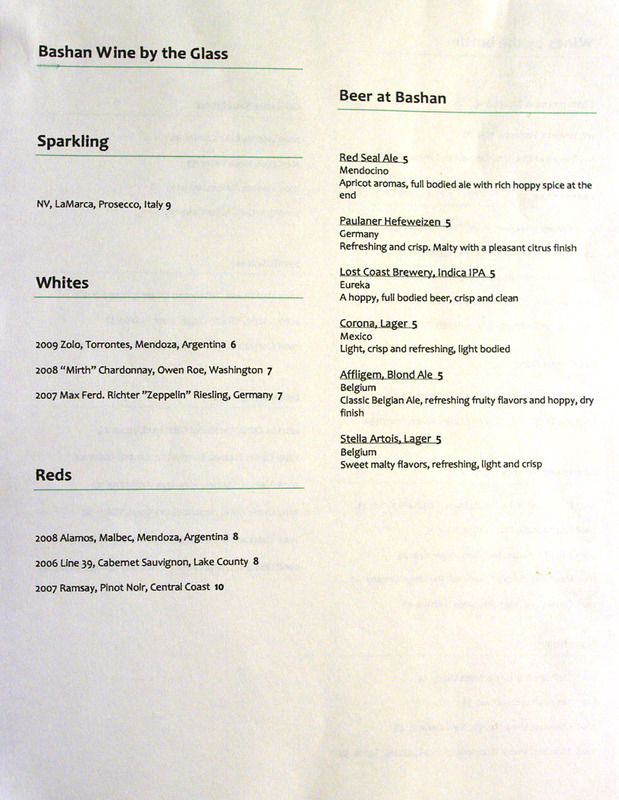 As for the tipple, you'll find a reasonably-priced wine list and a handful of beers; click for larger versions. One of the few items that isn't made in-house, sourdough bread comes courtesy of La Brea Bakery. 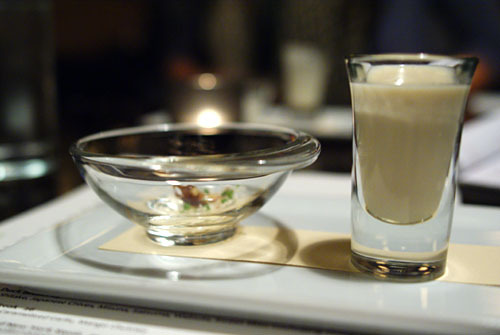 An amuse bouche was quickly brought before us, and we were instructed to pour the shot glass of soup into the small bowl of accompaniments. Before I did so, I first tasted the potage, and found it rich, creamy, hearty, and heartwarming, imbued with a subtle essence of cauliflower. After mixing the two elements, I found the resultant commixture lighter, brighter, with contrasting sweet and nutty notes coming into play. 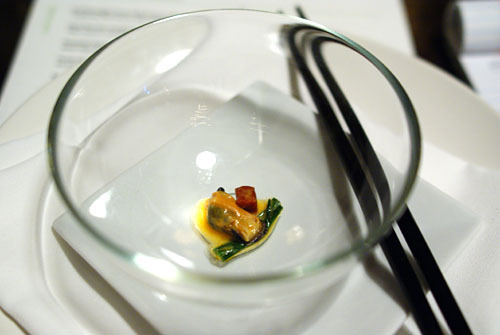 Our second amuse was just about the smallest PEI mussel I'd ever seen. Though it was decidedly diminutive, it was big on flavor, with the brininess of the mollusc coming in strong on the attack--tinged with the heat of paprika--while the finish was all about the salty chorizo. Burrata (a cheese made from mozzarella and cream) has almost become clichéd on menus these days--how many times have I seen burrata and heirloom tomatoes?--but Bashan manages to breathe new life into the ingredient. The key was the bresaola, a type of Italian air-dried, salted and spiced beef. It contributed a delightful savory tang to counter the creaminess of the cheese, while the use of tomato relish and fig added the requisite saccharine notes. A beautiful composition of tastes and textures. Regular readers will know that I often find squash overly sweet, a fact that did not bode well for this course. 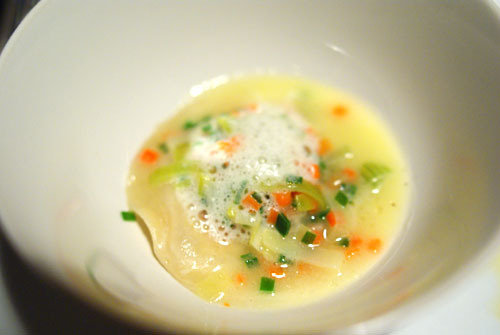 Indeed, taken alone, the raviolo was a bit sugary; however, its sweetness was nicely countered by the vegetal smack of the leeks and carrot. Overall, they made it work--nice texture too. Next we have an appealing preparation of monkfish. By itself, the fish demonstrated its signature soft, spongy body and fabulously savory flesh. That wouldn't be enough on its own, however, so the various accoutrements were absolutely key. 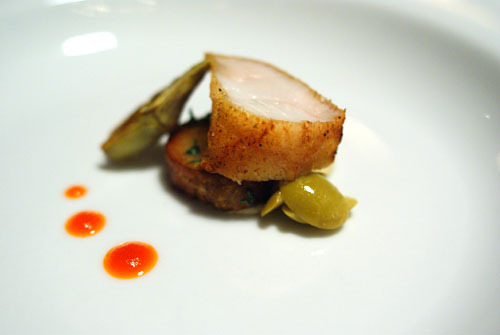 The dots of spicy pepper sauce provided a deft accent to the weight of the fish, while the piquant olives and artichoke also served as effective foils to the heft of the monkfish. The sunchoke, meanwhile, acted as a mitigating element. I wasn't as sold on the smoky baba ghanoush, however. 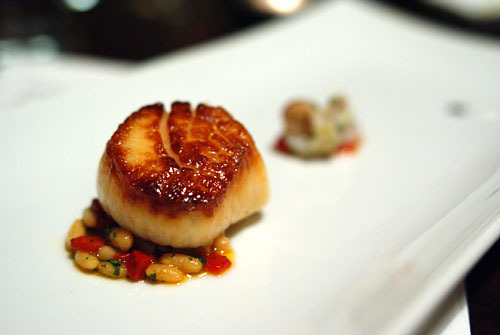 Sitting atop a stack of rice beans, the sole, singular scallop, masterfully cooked, showed characteristic sweet flavors, leading to a splendidly briny close. 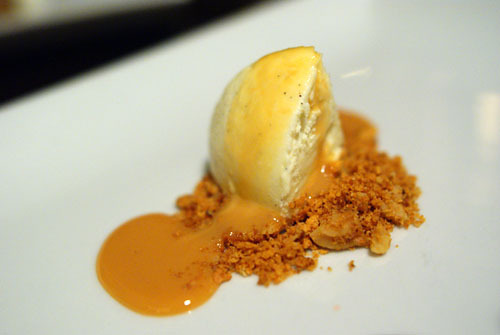 It was beautifully accented by the earthiness of the beans, as well as the tang of the piquillos. My favorite part of this course, though, was the squid, which did an absolutely fantastic job of highlighting the natural brininess of the bivalve. I did find the PX a bit superfluous, however. Bashan's Asian tangent, courtesy of Mr. Kim, is clearly evident in this next dish. It was an almost kakuni-esque preparation, falling-apart tender, imbued with a fatty, permeating, sweet yet savory flavor, with a hint of spice. 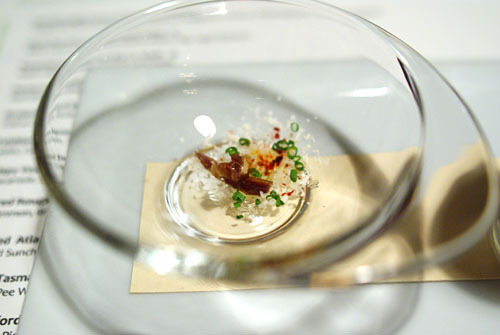 The daikon, then, was absolutely crucial in moderating the meat. First, we have the braised version, expectedly mild, which acted as a mitigating element, lessening the decadence of the pork. The pickled variant, on the other hand, balances the belly's power with a piquant zest. This was definitely one of the better pork bellys I've had in a while, and Selina seemed to agree--she took an order of it to go! Next we have my favorite course of the degustation. 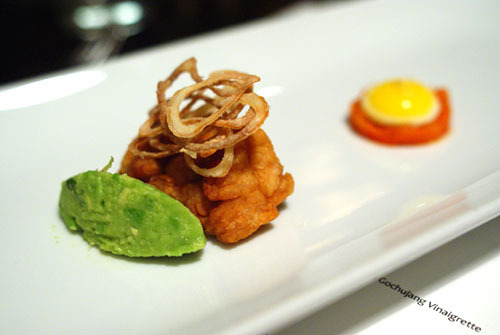 If done right, sweetbreads can be positively heavenly--these were. Texturally, a succulent, moist interior was enveloped by the wonderfully crispy outside, while the taste was an amalgam of varying savory notes, with a very subtle sweet flair to boot. The creamy yet tangy guacamole lightened the dish, while the tomato added a marked sugary character. After Selina tasted the sweetbreads, she added it to her to-go order! 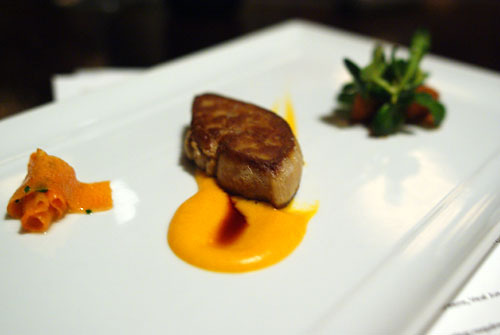 Knowing my entrenched disrelish for sweet preparations of seared foie gras, I was very wary of this dish. I first sampled the liver by itself, and found it actually quite good, nicely seared, appropriately savory, imbued with that signature foie gras verve. When I added the persimmon purée, the admixture was, as expected, too sugary for my tastes. To counter this, I made use of the tatsoi (spoon mustard), which provided a great pungent, bitter balance to the dish. 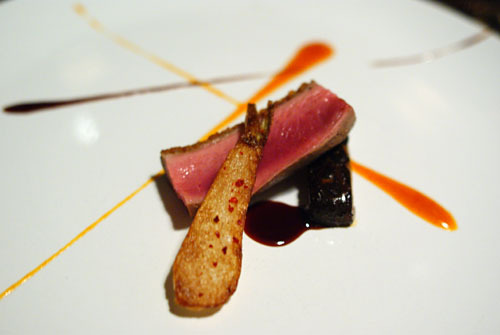 Another very Asian-inspired dish, we have here a beautiful rectangle of seared duck breast, just bursting with "ducky" savor. It was almost too flavorful on its own, if such a thing is possible. I loved the shiitake here, as the mushroom added a world of depth and earthiness to the bird. I also appreciated the radish, which contributed an offsetting bitter, vegetal element (though Jane found it a bit overwhelming). To finish, we had a delightfully piquant gochujang (a spicy Korean condiment) sauce, adding a bit of heat into the fray. 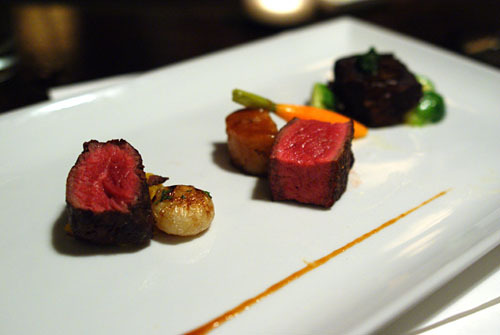 Our final savory course was a triplet of beef, presented à la Michael Mina. 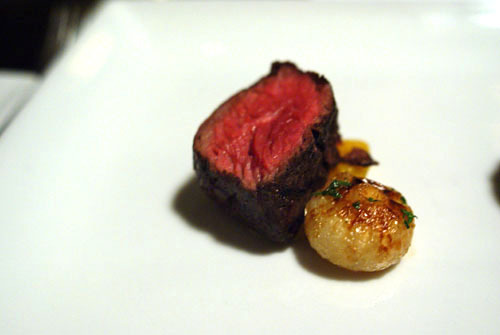 First up: though hanger steak isn't known for its tenderness, it is known for its "beefy" flavor, which was present here in spades. 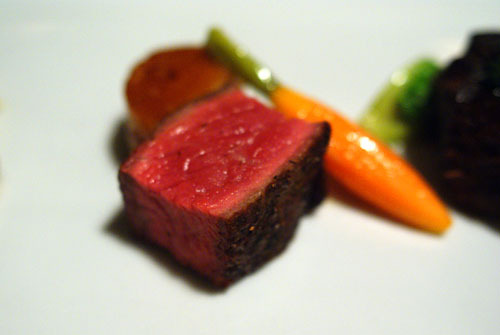 A juicy, succulent, salty cut of beef, I loved eating it just by itself. It was also quite tasty paired with the roasted cipollini, but the mango made the dish a touch sugary for me. Vis-à-vis the preceding skirt steak, the sirloin was noticeably subtler in flavor, with a more refined body as well--it was great to compare the two. What was interesting was that the New York almost had a nutty flavor on the midpalate, an unexpected, but not unwelcomed sensation. Further weight was added by the pomme fondant (sort of a potato cake), while the carrot provided a lighter touch. The last of the trio was also my favorite. It's hard to go too wrong with braised beef, and certainly this was no exception. 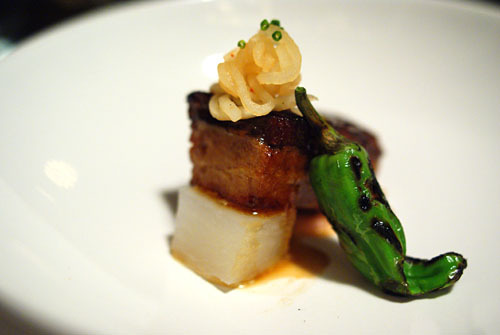 According to our server, the short ribs were braised in veal jus for eight hours, resulting in a stupendously tender consistency, but one with just enough bite to make it interesting. 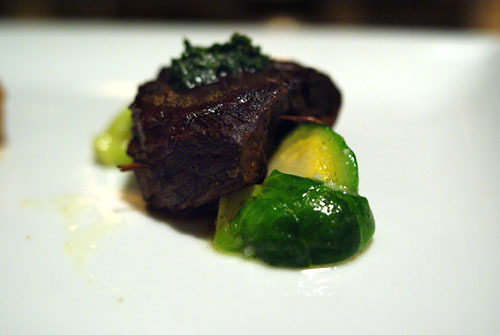 As expected, the flavor was dark, heavy, but the use of Brussels sprouts really brightened things up. Very good. Since I'm not a fan of peanut butter, I wasn't exactly looking forward to this dessert, but lo and behold, it turned out to be my favorite of the troika. The key was that the PB was subtle, and it was really the sweetness of the toffee that took center stage, balanced by just a hint of nuttiness. I also appreciated the cake's light, fluffy consistency--very nice. Though this looked positively decadent, it was actually a fair bit lighter than I expected, with the bread providing a sort of a tempering element. 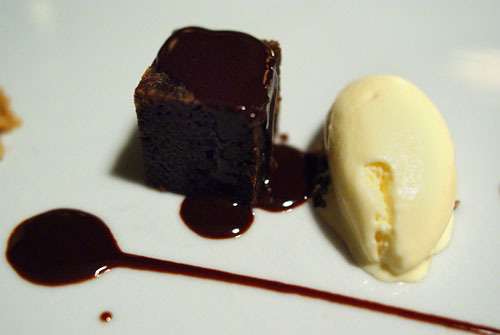 The pairing of vanilla ice cream with chocolate is a classic one, and worked well enough here. Finally, we have Bashan's cheesecake, which makes heavy use of crème fraîche, resulting in a characteristically rich flavor, but with a touch of levity. The dulce de leche added a marked sugary component to the dessert, while the graham cracker crumbles mixed things up texturally. After dinner, we were invited back into the kitchen. At around 200sqft, it's positively tiny, and may give LudoBites a run for its money for the title of smallest kitchen in the Southland. It's hard to imagine more than four or five cooks in here. 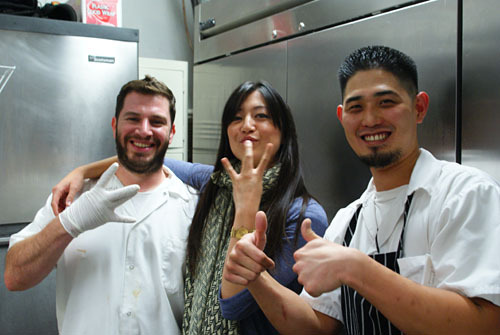 Executive Chef Nadav Bashan, ex-stagiaire Jane Kim, Sous Chef Jonathan Kim. I had high hopes going in to Bashan, and I'm happy to report that I wasn't let down. It's sort of the perfect neighborhood eatery--ambitious, but not pretentious, sophisticated, yet approachable. High quality, seasonal ingredients are combined with honest, unfussy, confident technique to create a refined, understated, yet truly enjoyable dining experience. If only Bashan weren't so far away! ... that looks truly delicious. Especially the steak and brussel sprouts! 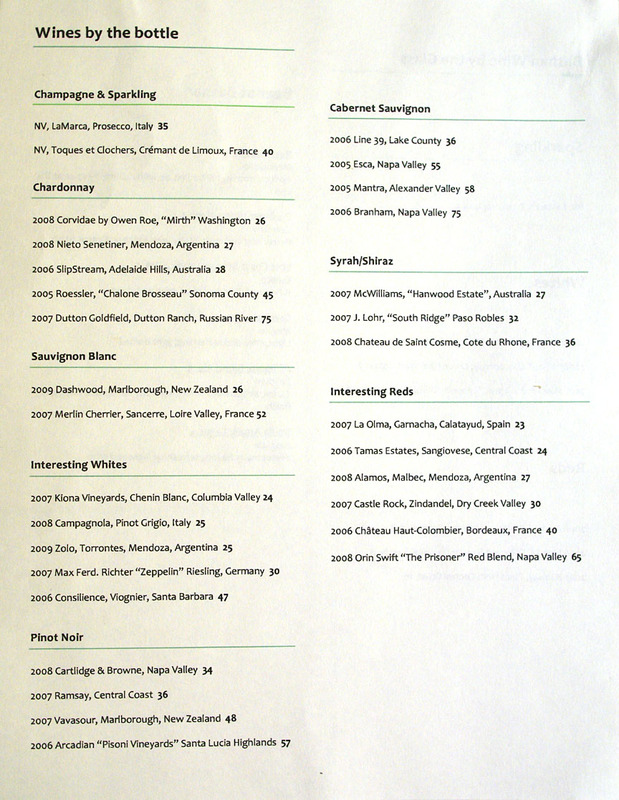 If you're in Glendale again, can I suggest Far Niente? (it's on Brand)... their seafood risotto is awfully good. I haven't been to Bashan in over a year. I also really enjoyed my meal there, but quite a few Chowhounders complained about their relatively unchanging menu. From the looks of your meal, the menu has changed little - crispy sweetbreads, maple leaf duck, etc, though the garnish and accompaniments at least have. 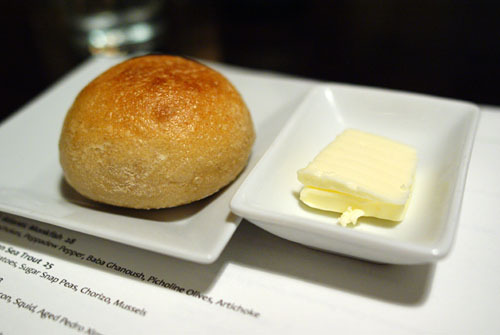 Thanks for the review, I just relived my amazing bashan dinner through reading it. i dined there last month, and i thought my entire meal was very heartwarming. I think Bashan holds up to any of the restaurants in LA. thanks for the review. 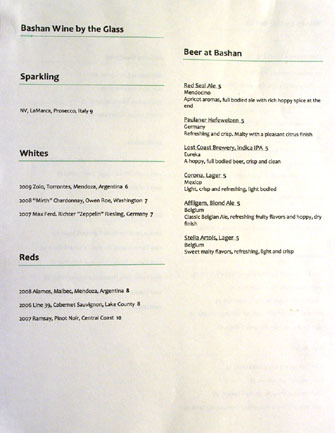 bashan is a great place..been there 3 times before we started blogging but haven't been in a while because we agree w/ gourmet pigs...menu hasn't changed much...and we haven't been back for awhile. But having said that, it's still excellent. Just stumbled across this because of Electra which is a wine we make. Beautiful photography. 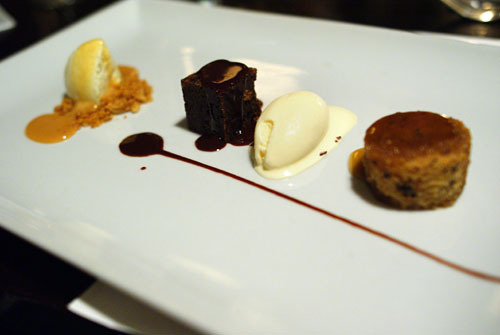 Question: How was the pairing of the three desserts with Electra ? Glad to hear you had such a positive experience at Bashan. It's currently my favorite restaurant in NELA. I enjoyed the tasting menu about six weeks ago and was impressed with just about every dish, but none more than the short rib. Per usual, another great review. I live in Pasadena and had never really desired heading into Glendale for a meal, until now. 1) Because you eat at such great places on a consistent basis, what do you do for lunches during the work week? Do you do high end as well? Maybe I should have gone to dinner, but I guess I'm in a "savings mode" right now. Looks like I missed a great meal. Hopefully I'll head to Bashan sometime down the road. Perry: Nice catch with the short ribs. ;) I'll keep Far Niente in mind if I'm seeking Italian in the area. Fiona: Interesting comment about the static menu, which is unfortunate. I'll have to see how it evolves. Stuffycheaks: I read your Bashan report. Looks like we had many of the same things! I was actually interested in the trout, but it sounds like that was a miss. Ravenous: Hmm...I'm not liking that the "replay" factor isn't high. Jo: Yes, you must! It's not that far from you either. 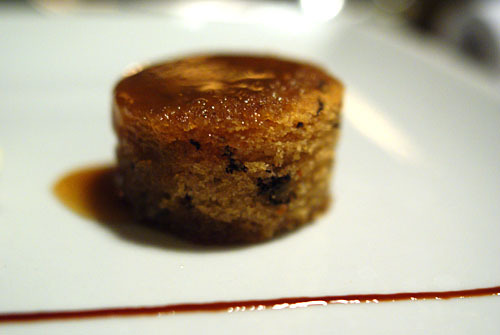 Andrew: It was superb with the fruitier character of the banana toffee cake, and also quite good with the cheesecake. The wine was passable with the chocolate, but for something like that, I'd prefer a more Port-like tipple. sygyzy: Maybe 'cuz it leaves nothing to the imagination?!? Josh: What else do you like in NELA? How's Palate? Danny: You should've come. Everybody flaked; it was ridiculous, and sad! Good to see that Bashan is still going strong. Looks like you got the tasting menu as well.